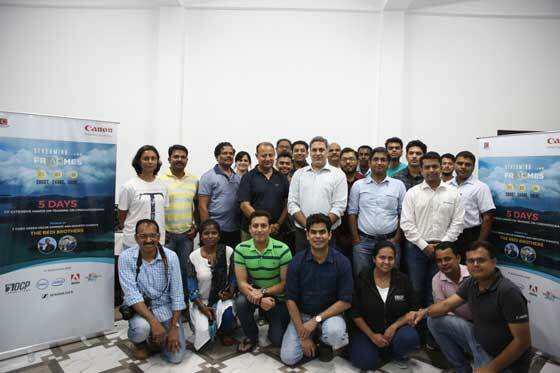 New Delhi: Continuing with its vision of strengthening the imaging culture across the country, Canon India, one of the leaders in the imaging space, commenced the third chapter of ‘Streaming Frames’ in Andaman & Nicobar Islands. Streaming Frames is a one of its kind cinematography training programme aimed at training 100 aspiring film makers live on field projects, spread across India on professional cinematography workflows for WEB as a platform. Scheduled from 20th – 25th January 2019, Streaming Frames offers vast variety of tips and tutorials along with hands on training by renowned cinematography mentors to help participants learn the skills of film making. Along with providing a platform to aspiring film makers to engage with industry veterans, the workshop also focuses on training them on the complete production workflow. The aspirants will be provided with a complete insight of the film making process and content design for Web/Broadcast media and hands on training to showcase and learn film making skills. Under the guidance of renowned cinematography mentors, the aspirants will be prepared to enter the field of professional cinematography and be able to create powerful, storytelling content. The first leg of the workshop was organised in Meghalaya in September 2018, followed by Udaipur in November, 2018. The next series of workshop will take place in Gujarat/Karnataka, wherein Canon will introduce and showcase wide variety of Cinema EOS and Multi Purpose Cameras and lenses like: Cinema EOS- C200, XC15, C300 MARK II, ME20FSH and Canon Cine Lenses. Highlights of the project will include five days of extensive on-field training by technology and industry experts, taking them through the process of film making and content design for web/broadcast, detailed technology insights from Cinema Cameras to Special Multi-Purpose Cameras, sessions on production and post-production and certification from Canon India on having completed the workshop. The participants have been travelling across the country and are directed and guided by Bedi brothers- Vijay Bedi and Ajay Bedi, who are brand ambassadors of Cinema EOS for Canon and highly respected film makers with three Green Oscars and several worldwide recognitions under Bedi Universal. Streaming Frames is boarded along with leading cinematography/film making technology experts: Dell for Professional Precision 5530 Mobile workstations series which are ideal for handling complex 4K footages on field, Intel with their 8th Generation Intel® Core ™ i7 processors, Adobe with their Creative Cloud Post Production Solutions, DCP Expeditions – Organizers of Streaming Frames and well networked across with photography & cinematography professionals and enthusiasts. The short films along with the BTS (Behind the scenes) to be designed by Lensocrat Films will be viral across all social media platforms – Canon and External both. All the participants and the alliances companies – Dell, Adobe, Intel, DCP Expeditions and Bedi Universal will also be promoting the content. The training has also recently collaborated with Sennheiser (world’s leading Audio Technology company from Germany designing products for Film, Media & Television operations) as Audio Technology Partners.